Haggai is an orphan. His parents died when he was still a young boy. He grew up and completed his education thanks to the generosity of others. He has always longed to assist children from disadvantaged backgrounds like himself. 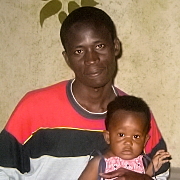 Haggai is an ambassador of Kipepeo Foundation in Kenya. He looks after our projects on site.